Distributor: Currently licensed by Sentai Filmworks.Currently unlicensed. Related Series: This is the direct sequel to When They Cry - Higurashi and was followed by the Rei and Kira OVA series in that order. Also Recommended: Yami to Boushi to Hon no Tabibito, Umineko no Naku Koro ni, Mawaru Penguindrum. Notes: Based on game by 07th Expansion, and manga by Ryukishi 07, published in U.S. by Yen Press. The little town of Hinamizawa, around the end of June 1983: it's the Cotton Drifting ceremony rather than Groundhog Day, but just as in that film someone is aware that time is repeating. (Well, here it's someone AND their sometimes-visible, sometimes-not companion.) But at least Bill Murray did not find EVERY one of his days ending with mass murder and horrific disaster. Our protagonist is understandably frustrated and bitter about this, but MAYBE- if her friends can be awakened to the danger- MAYBE with their courage and strength she can finally break the chains of destiny. But there may still be some false dawns ahead. Warning: Possible spoilers for both seasons ahead! The first season of Higurashi was, until the final story arc, all ghastly variations on the same theme: one of our heroine's friends would go mad in each iteration, and kill all their other friends. We were also told that there was a coup de grace that would end up wiping out everyone in Hinamizawa who HADN'T already been done in by her homicidal friend, including our heroine herself. This is obviously not something one would look forward to, but what to do? The final arc of First Season started switching gears, a bit. We find out who the primary protagonist of the story actually is, and get a hint that she leads a kind of meta-existence. And maybe of greatest significance, one of her friends "wakes up" a little, recovering some memories of their own prior turn as homicidal maniac, and begins to provide some encouragement that fate can be thwarted after all. They do indeed fall down, but keep getting up. And sooner or later maybe they can STAY up. Higurashi seems kind of a counterpoint to the Buddhist idea that the ideal reincarnation is one where you don't come back at all; instead of Nirvana, the kids in Higurashi would much rather have a full life in the corporeal realm. And the process they use to get there is one of acquiring knowledge, helping each other, and strengthening their own resolve- in other words, some key components of growing up. Aiden notes in his review that this season is quite a bit different than the first; now you know (since I may have spoiled things too much already, anyway, might as well say it) some of what that's all about. I undertook this 2nd Op mainly because of its re-release on video. 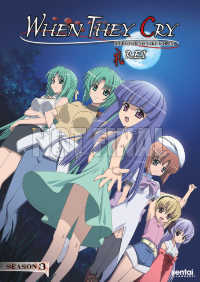 I've long been fascinated with Higurashi, though for a long time all of it I'd seen was the Geneon release of First Season; I finally saw the manga version of the final arc of Kai (called "Festival Orchestrating" in the anime and "Festival Appearing" in the manga) when that was released last year, and have to say that while both versions are high-speed thrills, the anime version is a bit less corny (Higurashi's carnage somehow seems much more plausible than its heroics), but on the other hand the anime's telling of the REAL villain's backstory seemed a bit disjointed compared to the manga rendering. -We see quite a bit more of the "punishment games" the girls play with Keichi, and how they blatantly cheat at times to make him lose; he's a better sport about it than I would have been. I feel for the poor guy, especially given how much he single-handedly contributes to overcoming their obstacles. -I'm always impressed at Rika's seiyu's ability to switch so easily between her "little girl" voice and her "other" voice. -Aiden had some issues with the character art in Kai. To me, by comparison at least the job that Studio Deen did with Kai's character art is a TREMENDOUS improvement over the crude caricatures that the characters were in Season One. And the game versions of the characters apparently look even worse than Season One's renditions. Perhaps the main problem is with the character designs themselves, and can only really be completely cured by reimagining them from scratch? -I kind of liked that we finally see a bit of the backstory behind the dam controversy. Apparently the people who accepted the dam project also had valid reasons for feeling the way they did, and THAT felt like real life. Recommended Audience: Sorry to tell you, gorehounds, that if you were looking forward to another twenty-four episodes of eviscerated adolescence and chopped loli then you are going to be bitterly disappointed. There is still blood and violence to a much more moderate degree and it still involves children but it is the slightest fraction of what season one offered us. If you were fine for the first season then Kai will be either a relief or a disappointment (depending on what you liked about the original).